Roughly 16-18 years ago, my mom went to the “Younkers Warehouse Sale” in Green Bay, WI, and found a great deal on a sofa for my brother’s college apartment. That sofa stayed with my brother up until 2008, when he and his wife got new living room furniture. Meanwhile, I was graduating from college, moving into my own place, and in desperate need of seating. They “donated” the sofa (and SEVERAL other pieces of furniture—THANK YOU AARON & PATTY!) to me, and there it has remained ever since. The original sofa, minus a seat cushion and both back cushions. Not long after acquiring “Stripey,” a name I just came up with, I decided it could use a little facelift because the upholstery was wearing a little thin in some places—not surprising after more than a decade of use. I purchased a “one-size-fits-all” slipcover in a neutral beige color. 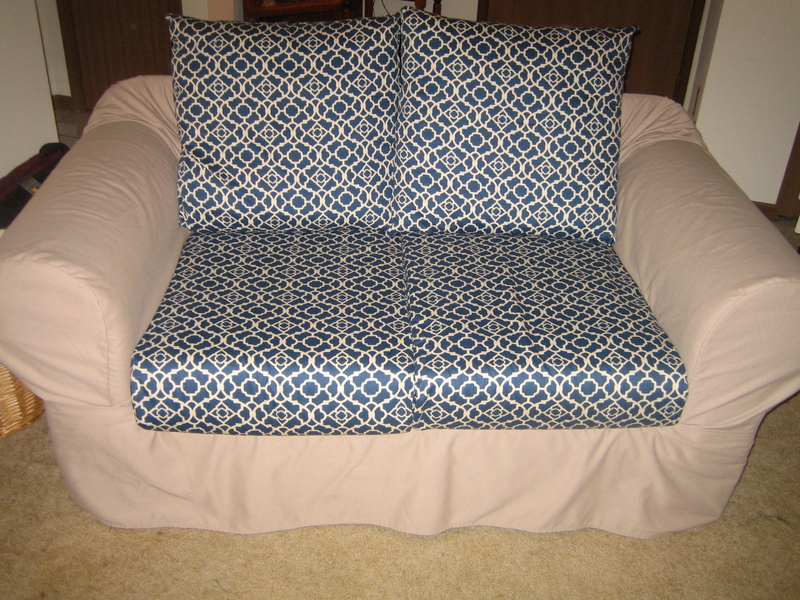 The slipcover looked fine and served the purpose, but it was a pain to keep from bunching up because the cushions were free to shift around beneath the slipcover. The reborn sofa, with all of the cushions! We’re still using the slipcover over the body of the sofa, but now it doesn’t get as bunched up as easily, and I think it has a little more character again! This was my first experience with sewing zippers. It wasn’t as difficult as I had thought it would be, but I definitely preferred this tutorial as opposed to the instructions that came with the zipper. 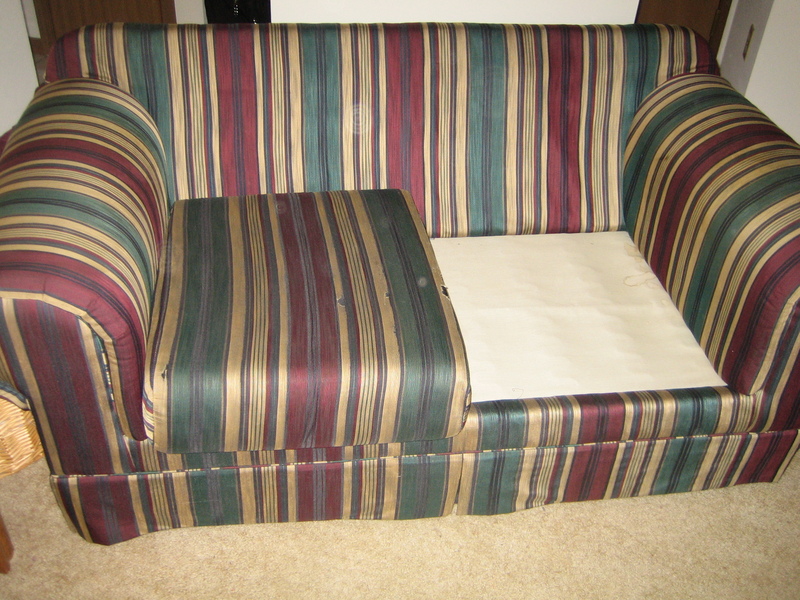 The back cushions were pretty simple overall, just two rectangles of fabric and a zipper for each. The seat cushions were a bit more complicated. I kept avoiding them until just a couple of weeks ago. I used the original covers as a pattern, even though I thought there might have been a less complicated way to piece them together. In the end, they turned out pretty good, although they don’t fit QUITE as snug as they could. Maybe I’ll get around to fixing that someday. Maybe. I’m pretty pleased with the result, and I managed to make the sofa look like new for a small fraction of the cost of actually buying a new sofa. I can only hope it has another 16-18 years of life left in it!